I finished binding the nephew quilt this morning. It's now in the dryer; one hopes it will survive. I was thinking I could check that off my list, but then I remembered that I also want to make a pillow to send off with it, so I actually managed to increase the size of my list by finishing something. Excellent. Things on the auction front are pretty well where they should be at this point (I'm design/decor lead this year, so thankfully I only have one auction to deal with), so I've been able to do some work on the 8th birthday party happening next weekend. We had a skateboard party when my boy turned 4, but even though he got his first skateboard that year, he wasn't too focused on it except for holding it as a sort of future fantasy, that he'd be a skater someday. Over this past year, though, he & about 3/4 of his good friends have become obsessed with skating (helped in no small part by the excellent public skate park that opened last summer), & so the theme for this year's party was obvious. Ok: I have, like many of you, a collection of MS Kids magazines, & when it became clear we were having a skateboarding party this year, I happily remembered the skateboarding party they featured that one time, & dug through my issues (well, looked it up on the internet, but then went & dug up the right issue to read the exact same info because I could) to find what I was sure would be the BEST fancy skateboarding party ever. EVER. I actually think this foam wallet is very cool, except I am not too sure how the bright colors & grosgrain ribbon would play around here (would have been excellent for 4yo skate party, though!). Maybe in black, with a sticker or screenprint on it. Does gocco ink stick to fun foam? Anyway, I am not even experimenting with these, because what if I gocco ink DOES stick & then suddenly I am desperately needing to order $50 worth of wallet chains? Oh, Martha. We're going to an indoor skatepark that includes pizza in the party rental; I'm sure it will be nothing like this lovely pinwheel-sandwich filled spread, but based on my fairly substantial birthday party experience, it turns out that the boys will not care even a little bit. Looking at this, I'm feeling sort of relieved that his birthday is too early in the year to make it worth the outdoor park rain risk, since I am SURE that I would feel compelled to produce this sort of over the top picnic (except I am just not really a pinwheel food fan, & also: Tex-Mex Chopped Salad is a crowd pleaser for eight year olds at a skate park? Really? I mean, my kid is an actual fan of weird grownup food & everything, but still I say: really?) & then stand around feeling mildly deflated when all of the slouchy, mumbling, dark-colors-skinny-jeans-wearing, hair-in-eyes-having boys wondered when the pizza was going to get there. I am still making cupcakes, though. And I ordered some vinyl sticker inkjet paper to mess around with. So I'm sure I'll manage to become just as ridiculous about this party as I do every year, despite the questionable skate park pizza. 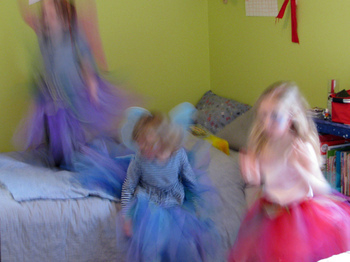 As I was making plans & gathering supplies for the fairy party, people kept warning me about my girl's sure-to-increase expectations, ie, the road to Birthday Hell is paved with fairy skirts & tiny cupcakes. Maybe, but on the other hand, this is probably the last year I'll have the opportunity to fill my house with tiny round-cheeked rowdy fairies, & soon enough she'll be nothing but lanky & sneering & demanding to be dropped off at the mall, so why not? Also, I am not denying that I do get a little crazy when party time comes around. But fairy skirts are actually really easy to make, if you do the kind where you tie strips of tulle around an elastic waistband. 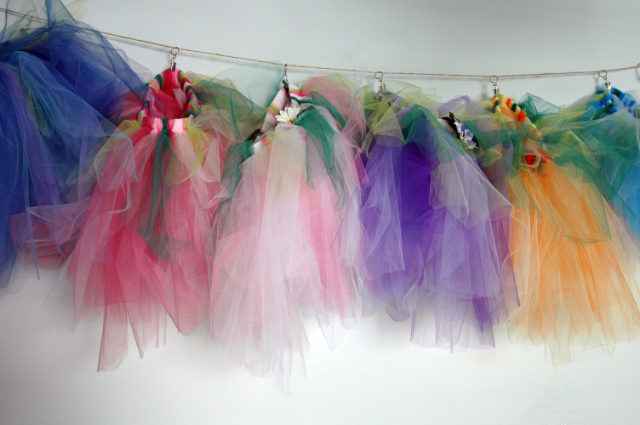 I bought armloads of tulle at a Joann's 50% off sale, was great because 1. cheap, & 2. I was able to mix colors with financial abandon. If not for the sale, though, I would seriously have considered getting the 6" wide spools of tulle instead (best prices I saw were at some of the big online packaging supplies stores) & made things easier on myself. Frankly, the girls were so busy fairying around or patiently waiting to get their faces painted that we weren't desperate for a craft activity, but they did all really like this one. 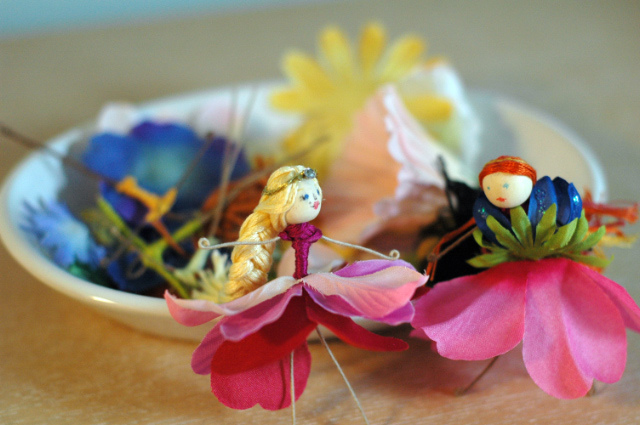 I had the fairy bodies & heads pre-assembled, & the girls picked out their fairy parts, picked & put on flower skirts, drew the faces on (or asked for help) & then helped glue. (From this Klutz book.) For this age range (3-5), I think this project only worked because all of the really time-consuming parts were pre-made, but I can see a similar but simpler clothespin doll project being another good option. 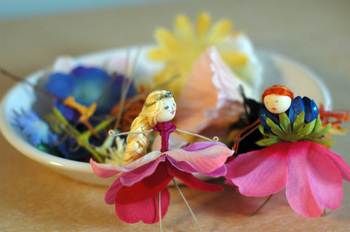 The fairy on the left is the one I made for a cake topper, the one on the right is the one my girl made at the party. My girl requested chocolate cake with strawberry frosting, "a big cake so it will be fancier than cupcakes." I chose the One-Bowl Chocolate Cake from Martha Stewart, & I have to say that it was a really terrific basic chocolate birthday cake. 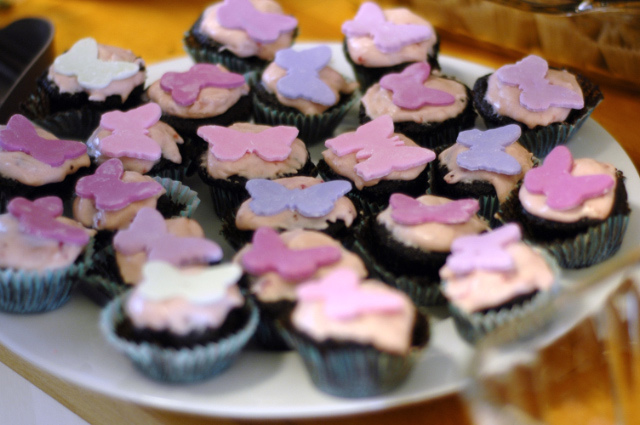 I baked two 7-inch layers, then used the leftover batter to make mini cupcakes. I wanted to fill the cake with whipped cream & strawberries, but wasn't sure how well it would hold up if I made it the night before, so I compromised with a variation on this recipe: 1 c whipped cream, 1 pkg cream cheese, 1 c sugar, 1 t vanilla, 1 c chopped strawberries. Delicious, definitely way too soft for frosting, but excellent for filling + upcycling into strawberry shortcake a couple of days later. For frosting, I started with this recipe, but instead of butter used 1/4 c vegan margarine (Earth Balance), 1/4 c vegan shortening (also EB), & 1/4 c vegan cream cheese (Tofutti). Excellent flavor, plus I was able to use it on my experimental vegan strawberry cupcakes, which did not make it to the party table due to being hideous, but which were very tasty. 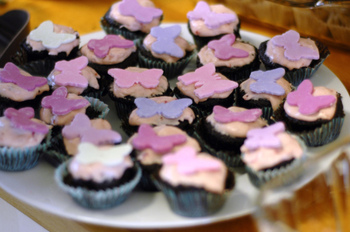 So, I am about to talk about fondant, but first I need to point out how the cute green & white striped mini cupcake papers are FALLING OFF the chocolate cupcakes. This sort of spontaneous paper-shedding has never happened to me before, so of course it was going to happen (1) with expensive cake store papers (2) right before a party. I ended up stripping half the batch & piping a bit of cake filling on top, then we frosted the few that were (sort of) holding on to their papers. There didn't seem to be anything wrong or unusual or possessed with the cake, so I'm not sure what happened, but if you try the recipe, watch out. Ok, the fondant. 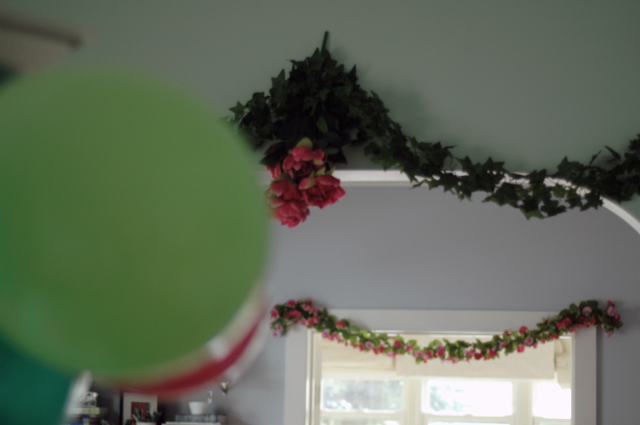 Short version: if you're just going to roll it out 1/8" thick & cut it into shapes with tiny cookie cutters, the hardest part of the project is mixing the exact color you want, except half a shade lighter because the color will deepen as it sits around. Also, have plenty of cornstarch on hand. Also, I see a whole new world of tiny-cutter-purchase-rationalization unfolding before me. 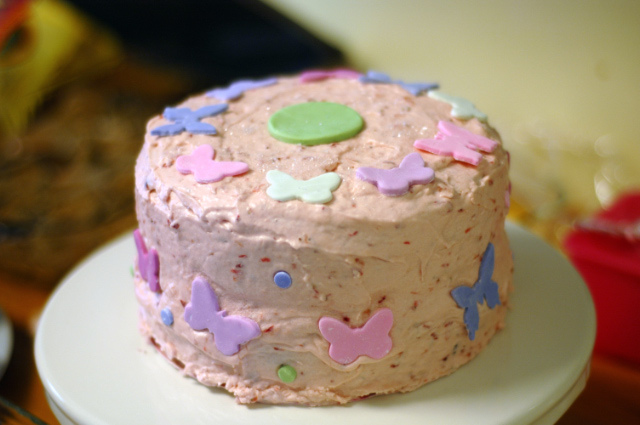 I was actually pretty worried that the vegan frosting wouldn't stand up to the butterflies on the side of the cake, leading to the heartbreak of a frosting avalanche, but even though I took the cake out of the fridge about an hour before serving, there was no problem. 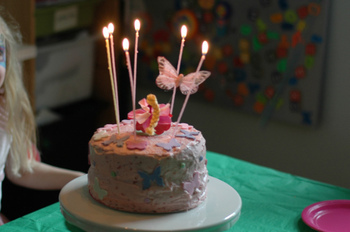 We completely failed to get a picture of the front of the cake, but it was quite lovely. And quite tasty. And, apparently, full of fairy energy.